Join the discussion on our forums! 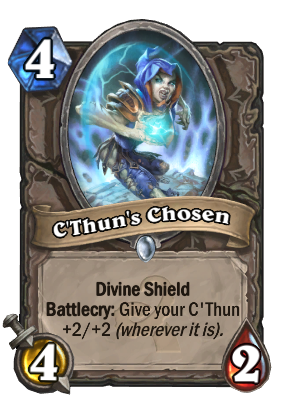 Come discuss C'Thun's Chosen over in our dedicated C'Thun's Chosen discussion topic. He gave her a promise ring and everything. Not so OPnies, but for Cthun decks this card is must have certainly! He gives board presence and give u one or two turn for develop others c'thun cards and buffs allmighty god - C'thun! Out of the whole Old Gods set, this is probably the card art I like the least. It looks like a hooded baby head on the body of a 15-year-old girl. Full art is like 50% more repulsive. Only C'thun decks are using this card, and not even all of them are. So, was it overrated? Whoever complains about this card being OP must not have actually play with this card enough to make a fair judgment. It's probably the worst amongst all C'Thun complements, and here is why. Class that you need a high damage minion(with divine shield) are mainly: Druid, Rogue, Warrior and Mage, which all have ping, either by their hero power or mini AOE. Therefore the divine shield is almost negligible. Zoo type of deck are mainly Shaman(Midrange or Evolve), Zoolock and Murlocdin, of which a divine shield 4/2 is completely useless on the board, plus you suffer the huge tempo loss. And since Reno C'Thun is less mature then Reno-N'Zoth deck, you couldn't either argue that it's good at late game. So yea a 4-mana C'thun synergised Scarlet Crusader is not bad, but it's certainly not good. Shielded Minibot for 4 mana and 4 damage and neutral? Screw C'thun decks this piece of OPness is going to be in every deck that needs a 4 drop. So I know they said C'thun cards won't be available in arena, but what about this one? It's not just a vanilla 4-drop with a C'thun-boosting effect. It's a totally unique 4-drop and should be available in arena. What do you guys think? I agree. A lot of the C'Thun cards should be in arena and would be good on their own which would then make me say why not just add C'Thun and the rest? Ben Brode spoke about this phenomenon. He explained that it is vital that Hearthstone contains cards of same cost that are terrible, good and great. This is not meant for seasoned players, who understand the game a little better and have a larger collection, but is rather meant for the new HS players who start with really basic, crappy decks, and need to feel they are developing and progressing through the game. By getting a 4-mana card that is considerably better than their 4-mana basic card, they will replace it on their deck and feel they have made progress in a very complicated scheme of deck building. So yeah... that's pretty much why. Clear examples of this are the Rager cards, 3-mana costs, 5/1, 5/2 and 1/5. They are supposed to induce these reactions in players. The full art clearly indicates undead, it's difficult to see in the card image though. Compare it with Polluted Hoarder. They have same stats and both of them are common. This card is as op as shredder against any class that can't deal 1 damage with hero power ,, in fact it might be even better than shredder in several cases as it guarantees 4 damage attack twice , no RNG , and the battle cry .